→How to Do a Backflip on the Trampoline? Jumping on the trampoline is very fun and brings you lots benefits. However, to make some tricks on this bouncy surface, you need to take time and practice. It does not require you to be as a gymnast on the trampoline. It is also right in case of doing backflip. This is the way you practice moves as a backdrop and then roll into backward without fears as possible. When you are good at doing these basic steps, you are possible to do a backflip. What You Need to Consider Before Doing Backflip on a Trampoline? You are not a beginner on the trampoline; even have long time playing on this surface to ensure necessary skill and balance to do it. It is necessary to strengthen back, stomach and neck muscles through some exercises such as pull up, crunches, jogging and basic startup movements. You should focus on these muscles because they are important in performing a backflip. Have enough knowledge of how to a backflip such as step into the center of the apparatus, and process here to avoid injuries. By the way, for more comfortable, you should perform backward movements like backdrop or back-roll. When you are accustomed to them, you can try a backflip. As usual, check carefully your trampoline before bouncing on it. Especially, the balance of the surface plays an important role so you must be sure of your trampoline is safe enough to do backflips. How to Do a Backflip on a Trampoline? Prepare your body: In order to have a profound preparation, you should have a partner to practice. They will spot you and help you make the process easier. For the first step, you need to rotate yourself by placing their arm close to your back and they will help you propel your feet over as you flip. The rotating step requires a harmonious combination so you and your partner should prepare before taking it in real. It is necessary to find a person comfortable on the trampoline because they are ready for supporting them in any cases. Warm up your body right on the trampoline by jumping around, limbering up your legs, jogging around and getting a feel for the material under your feet as well as bounce. After checking the trampoline to understand which type this is, you need to make sure you’re familiar with it once doing a flip without any weak spots. When your body is warmed, do a backdrop by falling onto your back and bouncing right back up. Then, throw your legs over, just a slow somersault. During doing the backdrop, throwing legs behind you and using the jumping back up due to rotate behind your body. Firstly, do a handspring over your shoulder toward side-ways. After bending your arms at elbows, letting it processing and over your head, at the same time propelling backwards and taking a full circle by fully rounding. This is considered to keep the jump in the air for the next motion. Afterwards, look behind you and drive your body as well as neck, bringing the rest of body towards the same direction. This is also helpful for you to place a bounce. Then, get a great bounce and jump up straight. Once reaching the peak of your jump, propel your body over the shoulder and land on your hands, and then knees are safe. Secondly, get more difficult handspring with back handspring. Back handspring is processed when you get over the shoulder handspring down. At this time, looking up and behind you. At the same time, direct your body and neck with it. In this case, when propelling yourself as backward, you may have injuries of fall off the trampoline. Thus, be carefully when you throw your body back. Thirdly, do these steps sever times until you can land on your hands and feet as well. In order to get your feet on the same place as your hands when you land, it is necessary to have more push of momentum. Your body’s parts will give you power including abs and hips. Try to throw your body into a full rotation when being into the air. More momentum is good for this motivation. Thus, you should tuck in your legs and arms. Also, try to make your surface area as small as possible to have same thing for your back-flip. The last, when you get accustomed with advanced steps, you could jump higher and higher each time. This skill requires harder push by leaning back and bending your knees. Besides, look back as you look into the sky to find the apparatus. Please try as much as possible to keep following the backflip. Thus, don’t think of your fear or frustrated thing. Remember that you can always pick it back up tomorrow, just practice more and regularly, you can achieve your skill. In general, this is a skillful motivation. If you are a beginner, you need to train more before getting it. 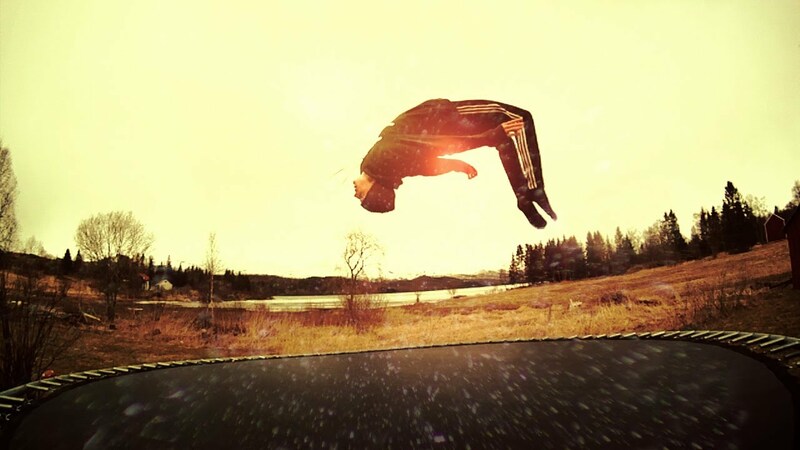 During the time of doing backflip; decrease your fear and try to let your body in the right way to ensure your safety but enjoying great bounding as well as happy time. You could give an attempt to do a backflip. Have you been ready for it?